Since his debut collection, art gallerist turned legendary couturier Christian Dior has generated an epic movement in fashion history. With lavish embroidery, luxurious fabrics, and elegant silhouettes, his designs were a revolutionary celebration of modern femininity when they emerged in Paris after World War II. Today, Dior’s global influence is as enduring and iconic as ever. Dior: From Paris to the World surveys more than 70 years of the House of Dior’s legacy, featuring a dynamic selection of over 100 haute couture dresses, as well as accessories, photographs, original sketches, runway videos, and other archival material. This exhibition profiles both Dior himself and subsequent artistic directors, including Yves Saint Laurent (1958–1960), Marc Bohan (1961–1989), Gianfranco Ferré (1989–1996), John Galliano (1997–2011), Raf Simons (2012–2015), and Maria Grazia Chiuri (2016–present), all of whom have carried Dior’s vision into the 21st century. 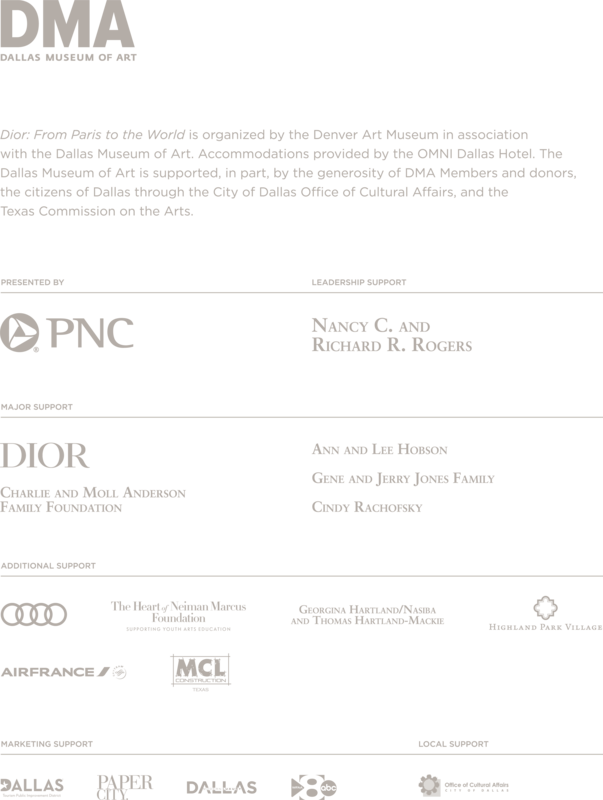 Dior: From Paris to the World requires a $20 ticket for adults Tuesday–Thursday, and a $25 ticket for adults Friday–Sunday, with discounts for seniors, students, and military. DMA Members and children 11 and under are free. Tickets for Dior: From Paris to the World will go on sale to the public on April 15. DMA Members will have access to a pre-sale to reserve their free tickets. Got questions? View the FAQ page for this exhibition. "Take a tour around the "Dior: From Paris to the World" exhibition in Denver"
"The History of the House of Dior"
"Dior: From Paris to the World Comes To Dallas This Summer"
"Dallas Art Museum Lands Blockbuster Fashion Exhibition, Joining Denver in an ..."
"The 6 Most Inspiring Fashion Museum Exhibitions of 2018"
Images: Gianfranco Ferré, Robe Hellébore, Dior Collection Haute Couture, Spring 1995. Photo ©Paolo Roversi/Art + Commerce; Christian Dior draping fabric over model Sylvie, 1948. Courtesy of Christian Dior; Maria Grazia Chiuri for Christian Dior. Haute Couture Spring-Summer 2018. “Dior Red” ball gown in tiered tulle fans, after the design Francis Poulenc; Portrait of Gianfranco Ferre, about 1990; Marc Bohan adjusting a toile over a model; The façade of 30 Avenue Montaigne, Paris, about 1947. Photograph by Willy Maywald. © Association Willy Maywald ADAGP, Paris 2018.